PDO Threadlifts in Worcester to lift and tighten sagging skin tissues. PDO Threadlifts in Worcester. Skin Rejuvenation From the Natural Wound Healing Process. PDO Thread therapy is an excellent and effective cosmetic technique that lifts and tightens sagging skin tissues. It can re-define facial contours and induce collagen production. The lifting effect can last between 18 months and three years depending on life-style. 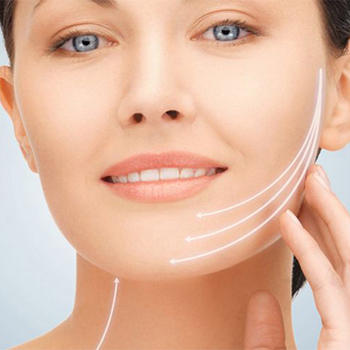 The PDO thread forms an integrated support structure for the tissue of the face due to collagen synthesis. The lifting effect is at its peak 6 months later when collagen has formed around the threads. The threads are made of PDO (polydioxanone) material which is similar to the threads used in surgical stitches. PDO would continuously stimulate collagen synthesis under skin. When inserted into the skin, it acts as a “scaffold” for the skin which helps to “hold” the skin against the effects of gravity. These “mesh” of threads can also shape the face by lifting and supporting sagging structures. The threads are absorbable and therefore will be reabsorbed in 4-6 months time leaving nothing behind but the skin structure created which continues to hold for another 15-24 months. PDO absorbable thread lift is for anyone who wishes to reverse aging effects by fixing these problems from the inside. As aging begins to be apparent from the age of 25, age tissues begin to thin due to the collagen and elastin fibres break down, resulting in sagging of skin, deep creases, folds and wrinkles. An excellent and effective cosmetic technique to lift and tighten sagging skin tissues. It redefines facial contours and induces collagen production. The thread will form an integrated support structure for the tissue of the face due to collagen synthesis. Downtime after a Thread Lift treatment is minimal, but it is advisable to take a couple of days to rest as you may experience some very slight bruising or swelling in the days following your procedure and some mild tension in the areas that have been elevated. This varies depending on the patients age at the time of treatment, the quality of the skin, degree of sagging and the number of threads used. However, studies have shown that results can last between 2 – 3 years. Local anesthetic is injected into the treatment area. The PDO Thread will then be introduced using a cannula or micro-needle in the required area. The needle is inserted into the subcutaneous layer of the skin, and when it is taken out, the threads remain implanted in the skin. Insertion of dozens of needles to the deeper layer of skin with absorbable threads activates their natural regeneration process and mechanical stimulation of wound healing and tissue contraction. The procedure takes around 45-60 minutes, depending on what treatment you require. PDO therapy is a tailor made treatment which can be adjusted to your requirements at any time. PDO Thread lifting is a very safe procedure and complications are very rare. Minor complications may include temporary swelling and bruising. Patients may feel slight tightness or a pulling sensation following the treatment but this subsides over a few weeks.